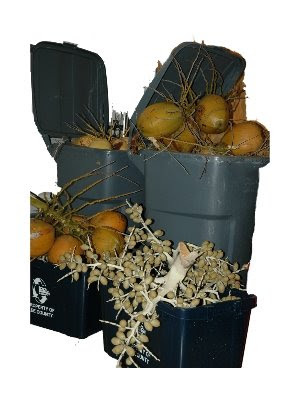 First, we have to remove all of the coconuts from our trees so they don't become projectiles and fly through our neighbors windows making us the scourge of the block - note the picture on the left! Doesn't look like that many you say? Well, lets just say they aren't as light as they look! Oh, and they're often covered in ants and spiders! Fun! Third, we have to stock up on water, canned good, beer and other non-perishables - oh wait, we're fine in that department! We even made cookies! Fourth, fill the cars and extra gas cans with gas so when we lose power we can still run the generator and fridge. Except, we usually just drive to Disney (the mouse always has power) so we just have to make sure one of the cars has enough gas to get to Orlando! Which saves us from the 1 hour wait at the Costco gas station! Fifth, locate all of the candles, lanterns, batteries and other emergency supplies that have become strewn about the house since the last storm! Of course the kids are totally excited because they think its 'cool' that we are going to be 'camping out' in the laundry room! The will gladly give up TV for undivided mommy-daddy attention! Sixth, put up hurricane shutters - which we haven't purchased yet because our house is still for sale and we're too cheap and figure we survived Hurricanes Charlie & Wilma so bring it on, Fay! Seventh, sit back and make a hurricane (cocktail)1 oz vodka1/4 oz grenadine syrup1 oz gin1 oz light rum1/2 oz Bacardi® 151 rum1 oz amaretto almond liqueur1 oz triple secgrapefruit juicepineapple juicePour all but the juices, in order listed, into a hurricane glass three-quarters filled with ice. Fill with equal parts of grapefruit and pineapple juice, and serve. To be continued after a trip to Lowe's for more duct tape! The kids thinks its duck tape and that we're bringing the ducks inside, I'm going to see if they can catch any of them!